Cal-500 is a high potency calcium supplement formulated to strengthen bone. 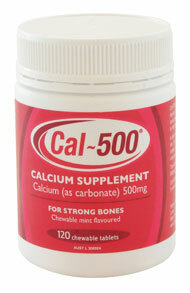 Cal-500 aids in reducing the risk of osteoporosis where dietary calcium intake is inadequate. The Australian recommended daily intake of calcium is 1000mg for adult women and men. The recommended daily intake of calcium for postmenopausal women is 1300mg. Cal-500 taken daily is a great way to supplement your diet to ensure you achieve adequate calcium intake everyday. Each Cal-500 chewable tablet contains calcium carbonate B.P. 1250mg per tablet equivalent to 500mg elemental calcium. Cal-500 is equivalent to Cal Sup 500mg Spearmint tablets (Reg TM iNova Pharmaceuticals Australia Pty Limited). Cal-500 tablets are spearmint flavoured chewable white round tablets. Each tablet is embossed with "Cal-500" & available in bottles of 60 tablets. Store below 25oC. The adult dosage is one or two tablets daily with fluid after meals or as recommended by your health professional. Tablets may be chewed, swallowed or sucked. Cal-500 contains no added sugar, lactose, gluten, salt, yeast, dairy products, artificial preservatives or colourings. This product contains aspartame & sorbitol. Cal-500 is suitable for sodium restricted diets. This medicine may not be right for you. Read the label before purchase. Follow the directions for use. If symptoms persist, talk to your health professional. Phenylketonurics - this product contains aspartame (phenylalanine).